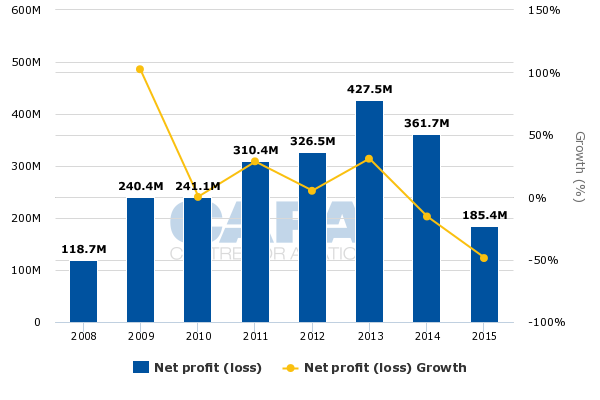 Panama's Copa Airlines managed to remain profitable in 2015 in what was the most challenging year that the airline had faced in decades. A contracting economy in Latin America, driven by Brazil’s crippling economic weakness, created significant challenges for all airlines operating in the region. Copa posted double digit declines in yields and passenger unit revenues for the year, which helped to erode the benefits of lower fuel costs on the airline’s profitability. Its net income plummeted nearly 49% year-on-year. Throughout 2015 and into 2016 Copa is making capacity and fleet adjustments to combat the economic realities in Latin America. But the airline is not taking an optimistic view with its passenger unit revenue guidance for 2016, which is lower than 2015’s performance even though Copa anticipates some faint signs of stability emerging in 2H2016. For now, it seems that all that any Latin American airline can do is attempt to reset their networks in order to diminish their exposure to the weakest areas in the region. Copa is making all the necessary moves to withstand the economic pressure, but in the short term its margins and profits will continue to fall below historical highs. Brazil’s recession (its economy shrank by roughly 3% in 2015), Venezuela’s economic collapse, and currency pressure coalesced to wreak havoc on Latin American airlines in 2015. Copa’s operating margins fell 7.4ppt year-on-year to 11.8%. Its yields sank 19%, driving a 20.8% decline in passenger unit revenues. Copa’s yield degradation offset the nearly 29% drop in fuel costs per gallon that the airline paid in 2015, resulting in a slide in profits to USD185 million, from USD362 million the year prior. Copa also posted a non-cash loss of USD25 million stemming from the settling of mark to market rates in its fuel hedging contracts. After 1Q2015, Copa’s yields and passenger unit revenues began falling in the 20% range year-on-year in each quarter. The significant declines were driven by economic weakness across Latin America and currency devaluation. At one point in 2015 Brazil’s currency fell 38% against the USD, and the valuation of Colombia’s COP fell 53%. Throughout 2015 Copa worked to mitigate the weakness in Brazil by slashing capacity to the country. It cut frequencies from Panama City Tocumen to Belo Horizonte, Brasília, Porto Alegre and São Paulo Guarulhos. In early 2016, the airline eliminated service to Campinas Viracopos. In early 2016, company executives stated that Copa's capacity to Brazil had fallen 30% year-on-year. The airline management estimated that yields in Brazil were negative 5% year-on-year in 1Q2016, and were flat in Colombia. 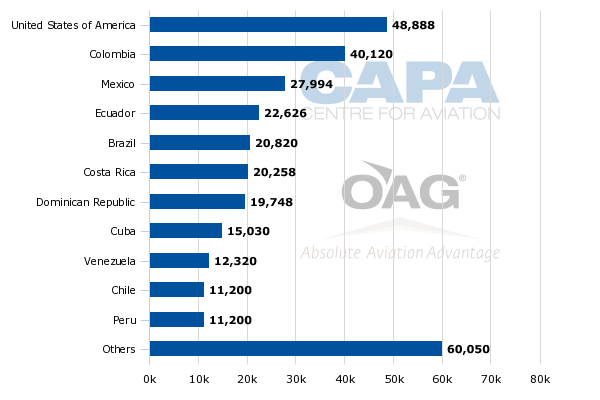 Even with the cuts to Brazil, the country remains Copa’s fifth largest international market measured by seat deployment for the week of 29-Feb-2016 to 6-Mar-2016. In Feb-2016 the Copa CEO, Pedro Heilbron, stated that some of the capacity from Brazil was redirected toward the new daily service launched to San Francisco late in 2015. However, most the capacity cut from routes to Brazil “is not flying right now”, he concluded. “We’re going to open additional frequencies to other markets, we’ve done a little of that. And we end up having additional surplus aircraft before the end of the year”. 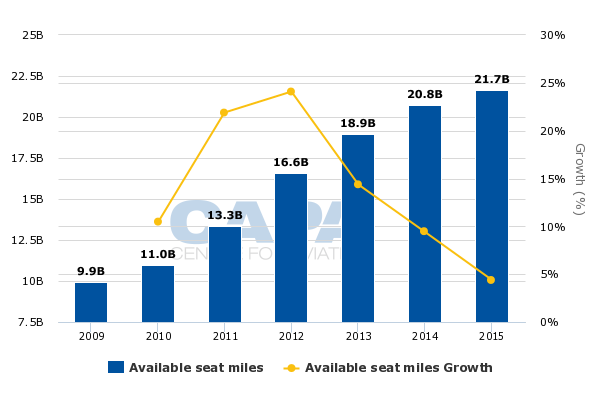 Colombia is Copa’s second largest international market by seat deployment. During the last three to four years Copa has opted to put less emphasis on domestic operations within Colombia; instead, its Copa Colombia subsidiary operates mostly international flights from the country. During 2015 Copa added new service from Panama City to David Enrique airport in Panama, Puebla and Villahermosa, Mexico, New Orleans and San Francisco in the US and Belize. Mr Heilbron stated that Copa is likely to add fewer new destinations in 2015. It recently announced new service to Holguin, Cuba beginning in Jun-2016. Holguin is the airline’s third destination in Cuba; at present Copa operates service to Havana and Santa Clara. The airline’s capacity growth slowed to 4.4% in 2015 after expanding 9.5% in 2014 and 14.4% in 2013. During 2015 Copa returned five aircraft with lease expiries and leased two Boeing 737s to United Airlines. It took delivery of nine new 737s, for net fleet growth of two aircraft. Orders include those placed directly by the operator and by lessors assigned to the operator, from 3-Mar-2016 onwards. For 2016 and 2017 Copa is deferring one aircraft delivery for each year. During 2016 Copa is taking delivery of a single 737 and returning two aircraft with lease expirations in 3Q2016, for a net addition of a single aircraft. t could sublease aircraft in agreements in a similar way to the deal that it reached with United in 2015 – to sublease two aircraft to the US network airline – and in 2017 there are six scheduled lease expirations in its fleet. The company is drawing some scrutiny for its planned 3% capacity growth in 2016, given the macroeconomic environment in Latin America. Mr Heilbron stated that most of the growth is driven by the full-year effect of new route additions and upgauging some routes to 737-800s from Embraer 190s. He concluded that the -800 offers a lower unit cost and is a more profitable aircraft. Mr Heilbron’s message is overall that Copa is being judicious with its capacity plans. He explained that Copa is being more thorough in managing capacity during low seasons by parking aircraft and reducing capacity. “Obviously we will react to demand as we see it in the coming months”, he stated. Current conditions in Latin America do not warrant a drastic change in outlook for any airline operating within the region. Mr Heilbron noted that 2H2015 was extremely weak, so year-on-year comparisons for yields and passenger unit revenue could be easier. However, Copa currently projects an overall unit revenue improvement of 2% for 2H2016 versus 2H2015. “It’s tiny, it is almost flattish”, he stated. Copa believes that currency fluctuations should stabilise in 2H2016, which only means that the devaluations should not be as sharp as the year prior. For the full year 2016, Copa projects passenger unit revenue of USD9.8 cents compared with USD10.4 cents for 2015. Its unit costs excluding fuel for 2016 of USD6.5 cents is higher than its cost performance of USD6.4 cents in 2015. Currently Copa expects to record an operating margin in 2016 of 11% to 13%. During the last two years Copa has been hit with an evolving situation in Venezuela where money it is owed has been frozen by the government; this was followed by a recession in Latin America’s largest economy, Brazil. The company has managed to remain profitable during that time, and should sustain its profits in 2016, but for the foreseeable future the days of 17.9% operating margins for Copa will be in the past. Copa seems to be taking all the right steps to weather the economic weakness in many of its major markets, but its stock price for early Mar-2016 fell from USD113 to USD61 year-on-year, reflecting investor concern about how long it will take Latin America to rebound. Even as Copa’s foundation remains strong, it remains in a holding pattern for the foreseeable future.